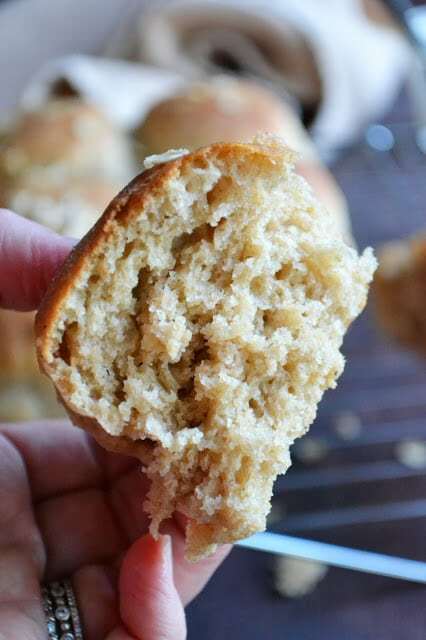 Quick Whole Grain Oat Rolls ~ these delicious yeasted dinner rolls can be made, from start to finish, in about an hour ~ pinky swear! It was about 4 o’clock the other day, my BEEF BARLEY SOUP was bubbling away on the stove, and I was just starting to wonder what else we should have with our soup for dinner. For some reason I was coming up blank, so I did what I always do when I come up blank—I Google-d the question. And lo and behold there were several answers to my query “What to serve with beef barley soup”. Never mind that the answer was a resounding ‘crusty bread and a salad’. Well, I could have come up with that myself. But it got me thinking…should I make a mad dash to the store to pick up a loaf? And then I had a much better idea. I remembered seeing these rolls on Debby’s site, A Feast for the Eyes, and I remembered that she claimed that they were made from start to finish in about an hour. I know, sounds more like a Lens Crafter’s commercial than a good dinner roll. But somehow I trusted Debby and I’m glad I did. We had fluffy dinner rolls with our soup last night and they were just as fast as Debby promised. I played a little bit with the recipe because I was going for a little more whole grain presence. Mine were fluffy, chewy, hearty and lovely. I will be playing with this recipe for a while forward, trying out different flours. Oat flour is one of my favorite flours to bake with, and I added a whole cup to this recipe. 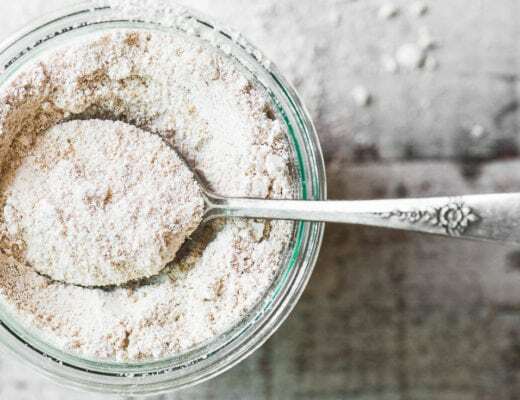 Did you know it’s super easy to make your own oat flour? All you need are oats and a food processor or a high speed blender! I used my stand mixer with its dough hook to do the work. You can of course do these by hand. The trick with so many yeast breads is finding the perfect warm spot in your house where the yeast can hang out and do its thing. For the first rise Debby suggests that you can actually use your oven—set it at its lowest setting for a minute or two, then shut it off. It will remain warm and cozy, just make sure it isn’t too hot. If you can find a spot that’s between 80 and 90 degrees F, that’s ideal. In the bowl of a stand mixer fitted with a dough hook, put the water, sugar and yeast. Stir to combine and let sit for 10 minutes until foamy. Meanwhile, mix the flours and salt together and set aside. Melt the butter, then add the milk and heat gently to about 110F. You can do this in a saucepan or in the microwave, but use a digital thermometer to be accurate. If it gets too hot, let it cool to the correct temperature. When cooled, pour the warm milk and butter into the bowl with the yeast, and then add about 2 1/2 cups of the flour. Turn on the mixer and mix for about a minute. While the mixer is going, gradually add in enough of the rest of the flour to form a soft dough--- it will start to come away from the side of the bowl. Let the mixer knead the dough on low for about 2 more minutes. It will be elastic and a little sticky. Take the dough a put it in an oiled bowl, turning the dough to completely coat with oil. Cover with a clean kitchen towel and set in a warm place to rise, about 20-25 minutes. Turn out the dough onto a floured surface and divide into thirds, then divide the thirds into three parts, for a total of 9 rolls. Take each piece of dough and form a ball in your hand, stretching corners around to the back and giving them a twist. The top should be domed and rounded. Set each roll in a buttered square baking dish. Cover the dish with a towel and set in a warm place to rise, about 20-25 minutes. Preheat the oven to 400 while the rolls rise. Bake for about 18-20 minutes until golden. Remove from the pan and set on a rack. Brush with melted butter immediately, and sprinkle on a few oats for garnish if you like. 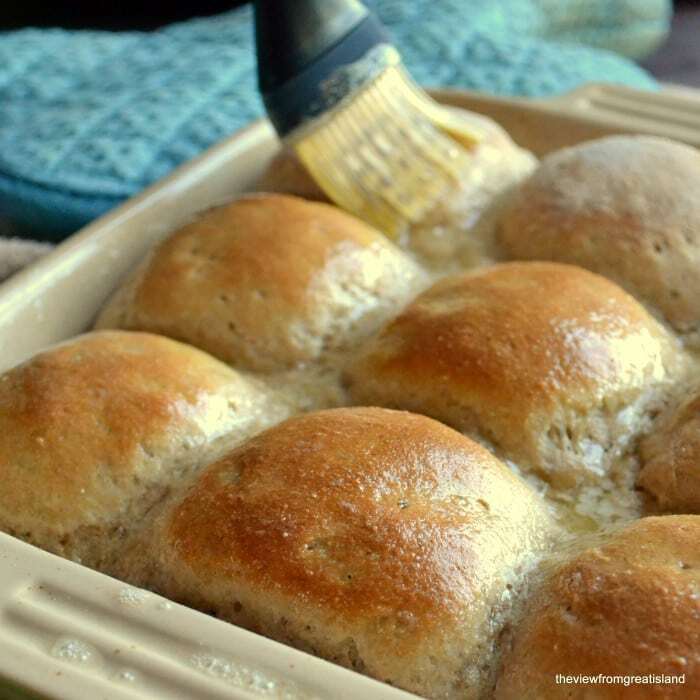 For a gluten free option try these Gluten Free Dinner Rolls. 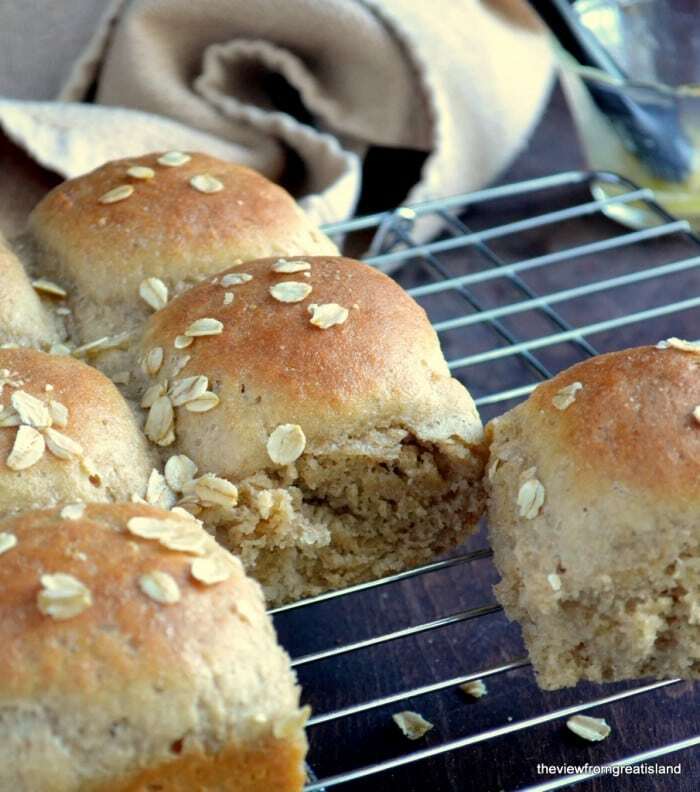 Don’t forget to pin these Quick Whole Grain Oat Rolls! I think you would need 5 tsp, or about 14 grams, of fresh yeast to equal the one packet (2 1/2 tsp) of dry yeast I used, Birthe. Good luck! I love this recipe. However, any ideas of what kind of flour I can use (gluten free) instead of the wheat? Those look delish! My trick for finding the perfect spot for the dough to rise is to take a small (1 quart) saucepan filled with water and bring to a boil. Then place the saucepan and the bowl of dough in the oven to rise. This creates a warm moist environment for the yeast to work its magic. It works every time…. You can also just turn on your oven light and put covered dough in oven to proof, it works the same. These look great. You should consider posting them to yeastspotting. Nice job! I might have to try these sometime. Wonderful rolls! I could live on soup and bread in the winter. Pinning! These would be great as buns, I didn’t think of that. I’ve never made buns, I guess you would just form flatter, wider rounds and put them in a larger pan? The mere mention of those lamb burgers has got me day-dreaming! These rolls look so good! 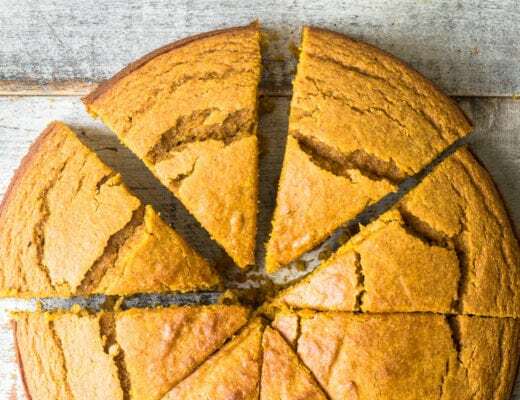 I can just imagine the moist crumb… :) Definitely sounds perfect with a bowl of thick stew! I’m all about the moist crumb, too, Eileen. thank you so much for posting the recipe… these really do look completely divine and just gorgeous… and so damn quick too… amazing stuff! Thanks, Dom. I don’t suppose they’d work with your New Year healthy eating regime, but I’m experimenting with eating a couple and freezing the rest. When you posted a teaser about these rolls, I wondered where you got the recipe. Thanks so much for the shout! I love that you used oat flour, and then added oats on the outside. Very clever! It’s amazing that you can have rolls in an hour, isn’t it? I made these a week ago, when I made some homemade soup. You did a great job. I thought you might recognize them, Deb! Thanks for a great recipe! Those look great. I am always looking for good whole wheat rolls and breads. I’m really excited about seeing how far I can take them in the whole grain direction. My favorite bread is pumpernickel, so I’m going to give that a try. These are gorgeous rolls and they look absolutely perfect inside too. A bread in truly under an hour? I’m going to play with this recipe soon. Thanks, Sue! No, not under an hour, ‘in about an hour’!! But still pretty quick! Dinner rolls are a real treat in my house. I do like the idea of all the whole grain flours. They really do look fabulous. The oat flour in particular is my favorite. I think it makes breads nice and chewy. Awesome! I just saw the kitchn feature a “no-time” bread that can be made in under an hour. Sounds like a great thing to know for when someone wants homemade bread, fast (always happens). Yours look so great, love the different flours. Oooh, I have to look that up. I’d like a quick bread to use for morning toast. 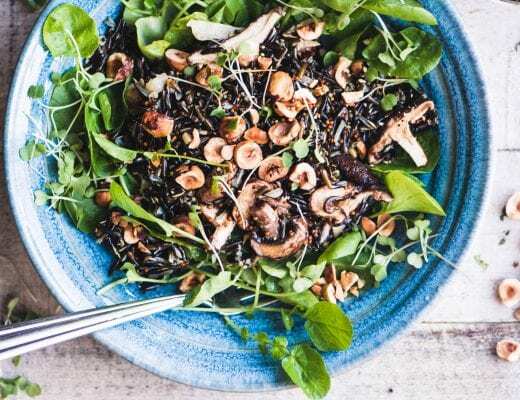 I was excited to come across this recipe until I read it. Ingredients call for equal parts of flour, 3 cups, and then the instructions says to add 3 1/2 cups to the yeast mixture and gradually add in the rest. Someone didn’t proofread and I guess it is an experimental recipe. Bread making has liquid to flour variables dependent on choices made in either ingredient. Humidity also makes exact measurements impossible as well. It isn’t a “proof reading” issue… it’s par of the course. I love these! 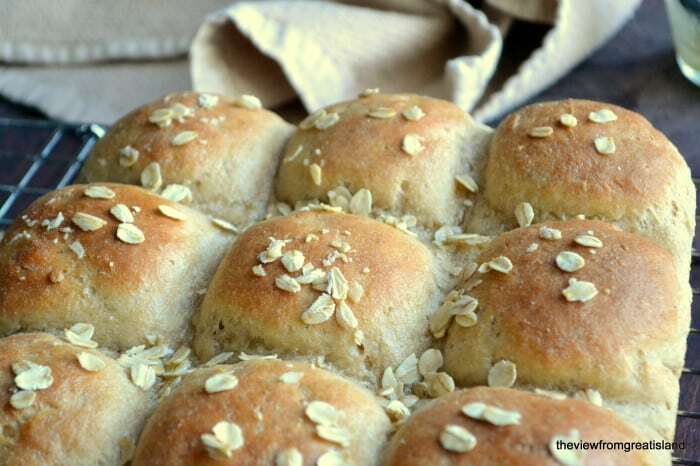 I made honey/oatmeal dinner rolls a few months ago and threw some raisins in there, too. They were really full of texture and good, but they weren’t 1 hour. Standard 3-4 hour yeasted bread type recipe. I am just blown away, Sue, that these are wheat, with oats, and you made them in an hour! The trickiest things to get to rise, and you did it…in an hour. And buttery. I want one! Pinning! The rise is tricky, at least in my experience. It really depends on your house and where you live. I set my rolls on top of the furnace for the second rise…worked like a charm! You know, I’m a soft bread kind of girl, myself. Sometimes those crusty loaves can get so hard you need a hatchet to break into them! You’ve made me very happy Sue :) These are wonderful and in only an hour? I am sold. Love the photo with the pool of butter between the rolls – on my … I am drooling. I made two batches, and what I really need is a bigger family to help me eat them! Oh those look beautiful! I’m hopeless with yeast but perhaps these rolls are good to start practicing with! This would be a great one to start with, Mary. It has an extra amount of yeast in the recipe to give it a foolproof boost, and I guess that’s part of why they can be made is such a short time.